Make the skewers: Using 8 large wooden skewers, thread onto each skewer 1 cube swordfish, 1 cube tuna, 1 scallop and 1 shrimp. Make sure that the seafood is flat on at least one side. Season with salt and pepper. Place the flat side down on a medium-high grill. When the skewer is nicely caramelized, turn the skewer over and finish cooking. Make the tomatoes: Toss the tomatoes with the garlic, olive oil, lemon zest and oregano. Season to taste with salt and pepper. To serve: To serve family style, use a large platter or plate, putting the tomatoes on the bottom of the platter. 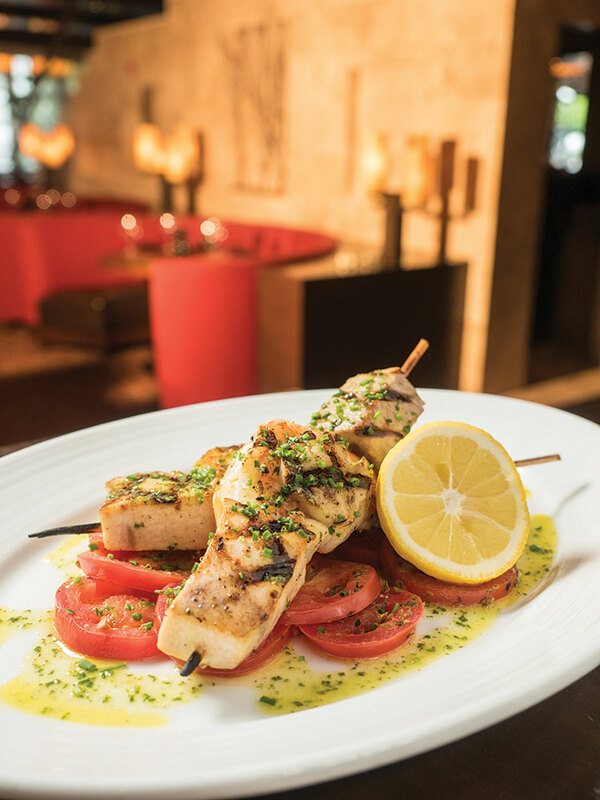 Arrange the skewers over the tomatoes, drizzle with olive oil, lemon zest and juice, and chives.